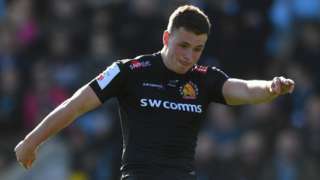 Exeter score 26 unanswered points against Bath to extend their lead at the top of the Premiership table. A police inspector says drivers will be prosecuted for "inconsiderate driving" if they "deliberately slow or stop traffic". Earlier, there were long tailbacks on the A30 - up to 5 miles - because of a so-called Brexit Blockade. About a dozen vehicles were driving slowly on the A-road. The convoy of motorists were unhappy with the slow progress of Britain's EU withdrawal. A former Royal Navy pilot who stalked his ex partner for years has been jailed for five-and-a-half years. Kim Allison had already been sent to prison twice for harassing businesswoman Nancy Galloway but carried on as soon as he was released. 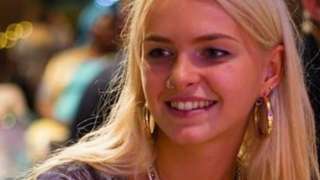 Allison, from Yeovil, spied on her by hacking into the website of her bridge club in Torbay, posted a profile of her on a pornographic website and sent her a Christmas card from prison, Exeter Crown Court heard. Allison denied stalking and three counts of breaching a restraining order but was found guilty by a jury last month. He was jailed by Judge David Evans, who also imposed a new restraining order which bans any contact and prohibits him entering large areas of Torbay. There are long tailbacks - up to 5 miles - reported on the A30 westbound in Cornwall, caused by a so-called Brexit Blockade. The convoy of motorists are unhappy with the slow progress of Britain's EU withdrawal. About a dozen vehicles set off on a 'go slow' on the A30 from Plusha to Truro just before 16:00. They are now travelling back to Truro. Pearl Bamford's mobile is thought to have been taken from her backpack near where she was found. This evening will be mostly dry but cloud will thicken later on, perhaps bringing the odd spot of drizzle. It will be relatively mild with light winds. Tomorrow will be mostly cloudy with a few patches of light rain or drizzle. There will be a gentle, north-easterly breeze and brighter skies may move down from the north later on. Two men have been rescued from Falmouth Harbour after shouting for help, after their boat capsized. They spent about 45 minutes in the water on Thursday evening before they were picked up by lifeboat. The coastguard told the BBC the men weren't wearing lifejackets, had no way of communicating with the shore, and had no lights on the boat. 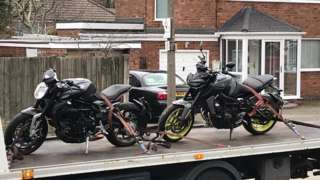 Large quantities of cash and vehicles worth about £40,000 are seized in raids by 160 police officers. The mother of a woman who's been in hospital for a year with a broken back says she's devastated her daughter still has not come home. Jackie Young, 31, from south-east Cornwall, says plans for her daughter Lisa to return home fell through because there weren't enough trained carers. The nursing agency responsible has apologised for the delay but says it has a duty of care to both patients and staff. Ms Young says the disappointment has caused distress for her daughter, who is in Royal Cornwall Hospital at Treliske. Devon both ways severe disruption, between Dartmouth and Kingswear. Devon - Vehicle ferry not operating on Dartmouth Higher Ferry in both directions between the Dartmouth junction and the Kingswear junction, because of strong winds. 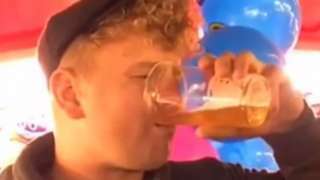 Josh Coles, from Devon, was at a fair in Somerset when he was filmed swallowing the live goldfish. Chelson Meadow Recycling Centre in Plymouth has been closed due to a fire. Plymouth City Council said no-one has been injured but the building has been evacuated. Devon and Somerset Fire and Rescue is currently on site. People are being asked to use Weston Mill Recycling Centre instead. 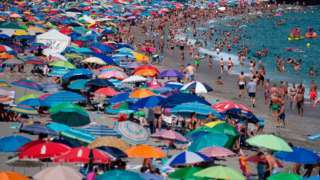 The travel firm is cutting more than 300 roles as it closes 21 stores across the country. Nine people have been charged with drug offences after a major operation in South Devon and Liverpool, police have said. Large quantities of cash, suspected drugs, stolen motorbikes, and a stun gun were all seized on Thursday. It follows an investigation by the two police forces which centres on the supply of Class A drugs from Liverpool to Torquay between 1 November 2017 and 21 March 2019. All nine people are due appear at Plymouth Magistrates Court later. A 26-year-old woman from Torquay was also arrested on suspicion of money laundering and conspiracy to supply Class A drugs. She has since been released under investigation pending further inquiries. The former leader of Devon County Council who's been charged with assaults on three women has released a statement saying he's innocent. Brian Greenslade, 70, from Marwood in Barnstaple, says he strongly refutes the allegations and that he will continue to carry out his public duties. He is charged with indecent assault on a woman in Exeter and another woman in Barnstaple between January 1994 and December 1995. The former leader of Devon County Council also faces a charge of sexual assault on a woman in Exeter between June 2005 and January 2006. The councillor is due to appear at Barnstaple Magistrates Court on 8 April. Mr Greenslade represents Barnstaple North as a North Devon Liberal. A landfill site that is believed to contain asbestos, syringes and even cyanide has been battered by the sea yet again, exposing what appear to be pipes and cables. Armed police are on standby at a Plymouth house and a number of nearby residents have been evacuated after a man threatened to harm himself. Part of Mount Gould Road between Gwyn Road and Farringdon Road has been cordoned off. Police described it as a "concern for welfare" issue and have not released any more details. The fire service is also in attendance along with police. A new type of camping pod is coming to Devon to help people with disabilities enjoy an outdoor holiday. It has been designed by a paraplegic man who struggled to find campsites which are truly wheelchair friendly. Paddy Costeloe, from East Allington, said too many holiday properties don't have suitable adaptations..
Mr Costeloe said he had done a survey of 1,362 self catering accommodations in the South Hams and 10 of them claimed to be accessible. There were over 5,000 exhibitors at the caravan, camping and motorhome show at the NEC in Birmingham and I think we were the only ones that were accessible." 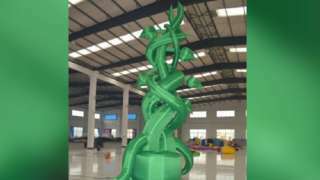 A theatre is hoping to jack up its beanstalk fund to replace the missing £3,500 inflatable prop.